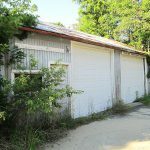 The busy agenda included a discussion of the Stop & Shop expansion and the planned demolition of the old DPW barn. All sides said they had reached a mutual agreement that was satisfactory to everyone. They said little else. 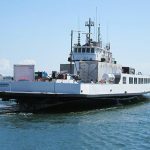 Whatever option the boatline chooses, rate payers can expect the costs to own and operate a new vessel reflected at the fare box. 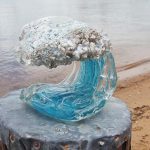 Scuba diving off State Beach, Stephen Worrell and his son Dylan discovered an unusual piece of art with an interesting provenance. 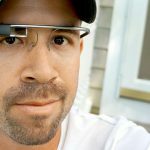 The Martha's Vineyard high school teacher is among a select group testing cutting edge technology that puts a wearable computer on an eyeglass frame. 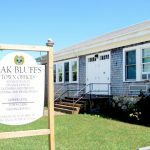 Preliminary findings show Oak Bluffs town hall and Oak Bluffs fire station are in such bad shape, demolition may be the most cost effective solution. 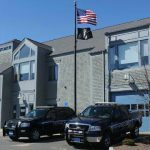 Happening by, Martha's Vineyard Dig Safe inspector halted an excavation that might have trashed utility service in Oak Bluffs. Leslie Hurd transports dogs from the Virgin Islands to Martha's Vineyard through her nonprofit Angels Saving Helpless Animals. The fish cakes were crunchy and tasty and made a delicious snack. 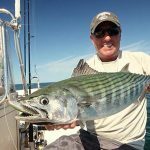 But catching a striped bass is the first step. Steven James, tournament organizer, said he expects future participation will wane in what he described as the town's unfriendly environment. 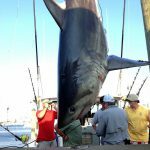 Monster Shark tournament mayhem was muted this year, thanks to prescient planning by police, and funds contributed by contestants. The choices include a vessel similar and size and design to the Martha's Vineyard or Island Home. The additional cost of service is a factor. This afternoon kids 5 and up will delight in Gus Ben David and his live creatures from his World of Reptiles and Birds. My wall calendar is still turned to June — no joke. It felt delicious to reach for a flannel shirt to put over my shoulders when I came downstairs last Thursday morning. A pat on the back goes to officer Steve Pupek of the Chilmark Police who sprang into action the other day when the bucket truck where he was doing a roadside detail began to roll. One of the roadside views on the Island that we do not want to see is an accident.